Tally-Ho: Wow, Sally, let’s go out and play! Sally-Forth: Run away! I’ll chase you! Sally-Forth: Hey, not that fast! Come back here and let me bite you. Tally-Ho: Okay! You try to bite me and I’ll try to bite you. Sally-Forth: This is fun! 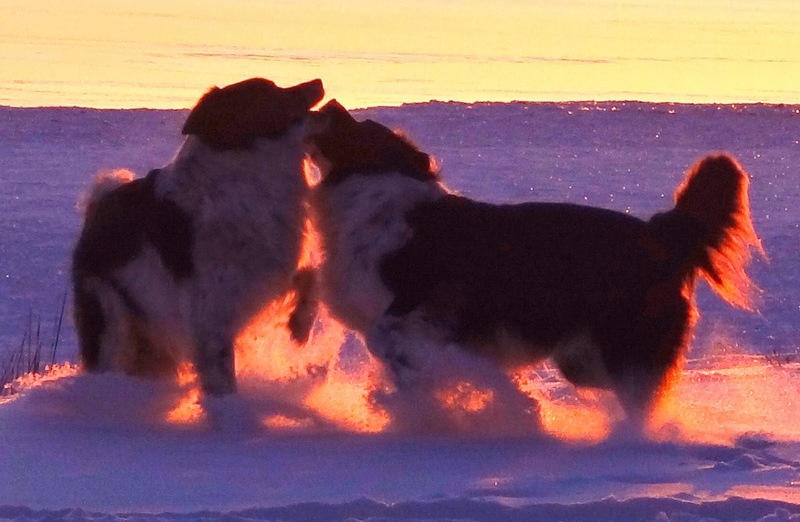 Why don’t humans love snow? Tally-Ho: Something about having trouble going places. Sally-Forth: Why do they need to go places? They can stay home and play. Tally-Ho: People are silly. Way too serious. Sally-Forth: It doesn’t make sense. It’s the only time they’re any good at tracking rabbits and mice and all the other animals we know are there because we can smell them. Most of the time, humans have no idea those animals have been near. Tally-Ho: Except for skunks. They can smell them. Sally-Forth: Let’s hope so, or they’d really be pathetic! Why is it they don’t want us going near skunks again? Do you and your pets agree about snow, or do you disagree? 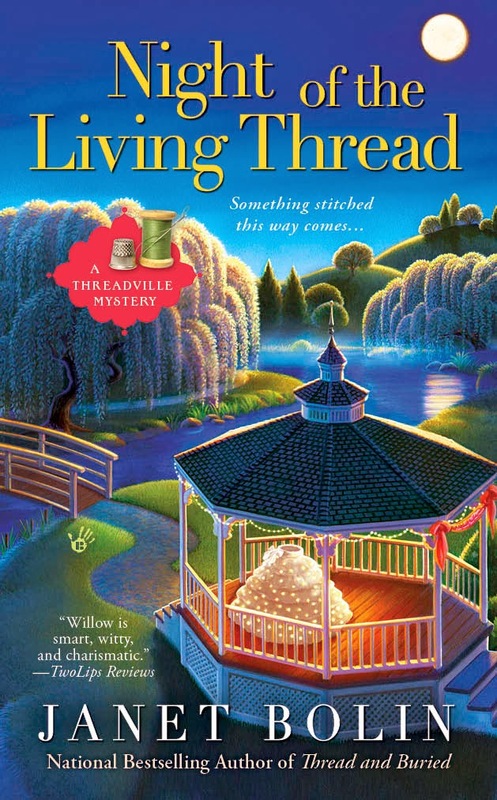 Janet Bolin's fourth Threadville Mystery, NIGHT OF THE LIVING THREAD will be on shelves on June 3, 2014, and can be pre-ordered from these booksellers. Read the first chapter here. 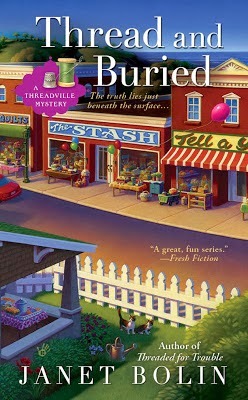 The third Threadville Mystery is THREAD AND BURIED. The first Threadville Mystery, DIRE THREADS, was nominated for both an Agatha Award for Best First novel and for the 2012 Bony Blithe Award. The second in the series, THREADED FOR TROUBLE, was nominated for the 2013 Bony Blithe Award. Visit Janet at facebook and twitter. My Holly, who is a Lab/Boxer mix and will be 14 this year, loves the snow and so do I! We have a great time playing in it. One of my favorite games is "Where did the ball go?". I throw a snowball at her, it poofs out in the snow in front of her and she tries to figure out where it went. And old girl that she is, she's still runs like a puppy on a good snow day! That sounds like a fun game, but not as much fun as snapping at your brother or sister! Although we rarely see snow here in Ashton Corners, the cats are definitely against it. I would love a snow day here or there. I realize it might grow tiring if it was a sure thing every winter though. I can't imagine what the cats would think of that! !